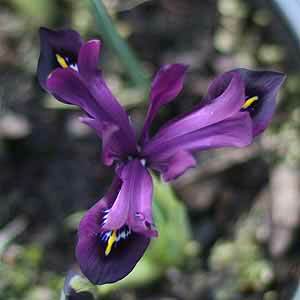 Although not as widely acclaimed as some, Iris reticulata ‘George’ with its deep purple flowers is a stunning cultivar. This is another hybrid between Iris histriodes and Iris reticulata. The flowers are a really rich velvety royal purple with yellow markings on the falls. The main show of foliage appears after the flowers, upright and sword shaped. Although not unattractive is a bit of a sideshow. Grow Iris ‘George’ in the rock garden, or a raised well drained bed. Also suited to growing in containers, however not a long term solution, ‘George’ seems to like a rest in the garden after 2 – 3 years. 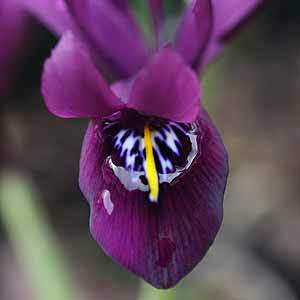 By division, in good conditions you can divide Iris reticulata ‘George’ every 3 years. Snails and slugs can be an issue with new flower shoots. The petals can be quickly damaged. Surround the plant with some grit to deter them. Bulb rot if allowed to stay wet through summer can cause quick deterioration. Plants left in pots for a number of years also seem to lose vigour. Flowers – Winter to spring deep purple petals and falls marked with yellow.